So… whatever became of me? (Left to right, front) Amanda, Steph, Cammie. Judy & Steve Van Rooy (back). December 2005. You have read these stories and may wonder where I am and what I do now. I left for the U.S. in July 1968 and started college at Seattle Pacific College (now University). SPU was, and is, a small Christian liberal arts college. The shock of being transplanted back to my parent’s homeland was pretty significant, but there were few other choices and this college was as good as any. My dad attended this same college and my older brother Gordy was already there. He showed me the ropes. My memory of college is that whatever fun I may have had was overshadowed by the responsibility to earn enough to pay way my through. My parents mission had a fund that helped a bit, and my parents had an account that helped some, but most of it I had to earn myself. That meant I had to hustle. And I did. I worked 2 hours a day during the week on a work-study program, and eight hours (at least) every Saturday on various aspects of maintenance (mostly stripping and waxing floors and cleaning toilets). Plus, of course, every vacation. 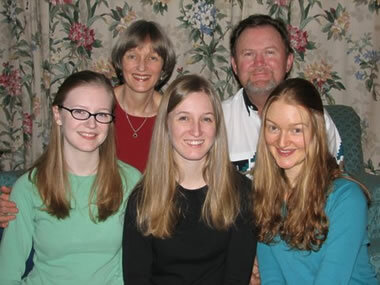 During my first summer there, Miriam Redding (same mission, same class at Woodstock) was taking linguistic courses at the University of Washington sponsored by the Summer Institute of Linguistics (SIL), linked to the Wycliffe Bible Translators. I found I could get credit for those classes, so the summers of 1970 and ’71 I took the first and second year SIL. By the end of the second summer I felt comfortable that Bible translation was a good fit for me. It also occurred to me that if this was going to be my career–Bible translation in some remote location–I probably ought to go to Seminary and get some training, and my particular interest was Greek and Hebrew. And that is how I ended up going to Dallas Seminary from 1972-76, graduating with a Th.M. I had already joined Wycliffe (in 1971, just before graduating from college). And while in seminary, about half way through, I was introduced to Judy Beekman, an M.K. who had grown up in Mexico and whose parents had been translators there. She was in Dallas teaching Spanish and living with her folks. We married shortly after I graduated from Seminary—clearly the best stroke of providential good fortune with which I have been blessed. After some further training and group service in the U.S. our first overseas assignment was in Sudan as translators. We spent a year in Khartoum learning Arabic, a task I thoroughly enjoyed, but boy was it hot. Our first (of three) daughters was born there that year. We moved to a remote village in S.E. Sudan among a people-group called the Didinga. It was not the end of the world, but we could see it from there. And it was perfect. A real need. Far enough away that there would be few administrators looking over my shoulder. And abounding in game (I had a rifle and a shotgun). We built a mud-walled, thatched-roofed house and, a bit later, an airstrip. And then everything changed. Cammie, then only 2, came down with a vicious variety of childhood cancer for which there was no treatment and no cure. We were crushed. In the Spring of 1981 we ended up in Houston at M.D. Anderson Hospital, a world-renowned cancer and tumor research and treatment facility. Against all odds Cammie lived and was in the first tier of survivors for that type of cancer…ever. We were in the U.S. six years in all, and in 1987 we were cleared to return to Africa. This time it was Nairobi, Kenya, working in the Africa Area Office which entailed travel all over Africa. Following this four-year stint, we were back in Dallas in a fund-raising capacity with Wycliffe for four years. After 25 years of service as a missionary, I felt a change was in order. With a few friends I helped start a small ministry-related thrift store in one of the poorest parts of Dallas. To put food on the table, I ramped up my involvement in real estate—something I had been piddling with on the side for about 15 years as opportunities presented themselves. I seemed to have a knack for it. And I hit a window of opportunity just right—multi-family dwellings in a depressed part of Oak Cliff, just west of downtown Dallas. And about the same time I was asked to join the board of Operation Mobilization, U.S., in Atlanta. 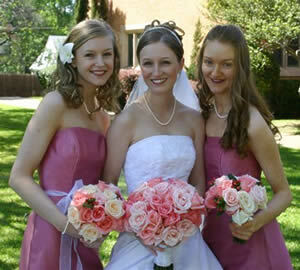 My three lovely daughters, Amanda, Stephanie (the bride) & Cammie. Celebrating Stephanie and Brian’s Wedding, April 2006. 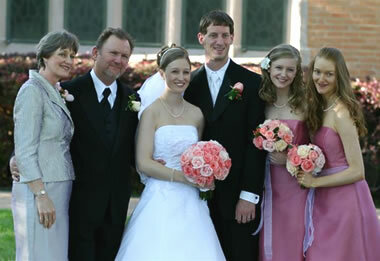 Judy and Steve – Proud parents of the bride (on the left) Amanda & Cammie (right). My three girls are now all adults. Cammie has survived two recurrences of the cancer she had as a kid. She is now married with 4 girls, all adopted, all sisters. Stephanie graduated from med-school at U.T. Southwestern here in Dallas. She and her husband Brian plan to be missionaries. They have three children. Amanda, the youngest, is a nurse. Cammie has had three occurrences of her cancer. Each time the experts thought she would not make it. I have lost count of the number of invasive procedures and surgeries she has had (about 16 or so) and her life has been anything but normal. We, as a family, have been indelibly impacted by her life-and-death struggle—something that is, strangely enough, a blessing that I would not trade at this point for anything. I was blogging Cammie’s situation before blogging was a word and I will be posting (on this website) my collection of what I wrote at that time sometime in the near future. 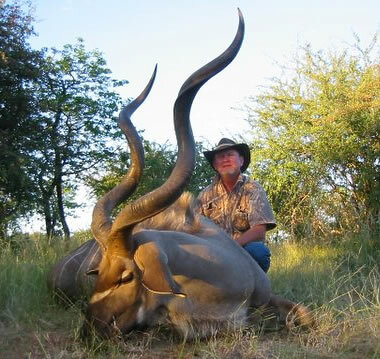 Still enjoy hunting, here a magnificent kudo (South Africa). Life is good. I love to read. There is no bad day if I can spend an hour reading. I still like to hunt. We have a small ranch an hour south of Dallas that we get to a couple times a week and built an energy efficient cabin there. We own this ranch with one of my Wycliffe colleagues Gary Shepherd who, with his wife, has spent 40 years in Nepal.. I learned to fly and owned my own small airplane at one point. And we continue to enjoy travel (as do most third culture kids). I doubt a day goes by that I am not reminded, in some way, of growing up in India. When I get up in the morning, the first thing I do is make a cup of tea —masala tea—a blend of cardamom, cinnamon, a hint of ginger and a few other spices. And no tea bags, it must be loose tea. With milk. And it is way too sweet for most people’s taste. My choice for eating out for a special occasion is nearly always Indian. And we have Hindustani khanna (Indian food) several times a month. Dear Judy has learned to cook a considerable variety of Indian foods. True love. Several times a year I will go down to the Indian store where we buy our rice and spices and buy several Hindi movies. And I will strike up a conversation in Hindi with virtually any Indian I meet. 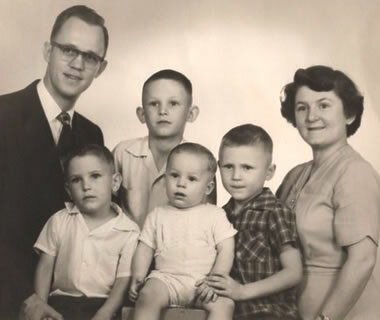 My “aunts and uncles” from the mission field remain, to this day, as close as any of my real ones. After years of necessity, I remain a bargain hunter, even when the situation does not call for it—a malady with a beneficial by-product, in my opinion, but one my girls think is a bit strange. My house has several pictures from Mussoorie, where we grew up, hanging on the walls, and in the office a picture of the Taj and an etching of William Carey (considered the Father of modern missions and a missionary to India). One shelf of one of my bookcases is dedicated to books about India–all of Jim Corbett’s books, and a number of books by people I know who have written about their experiences there. And a number of our throw rugs are Indian or Tibetan. 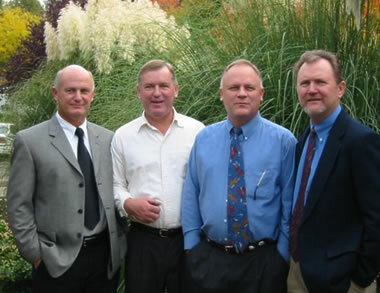 The Van Rooy brothers (left to right): Gordy, Norm, Vern & Steve, 2004. I stay in touch with many of my classmates. Out of the 40 I graduated with there are three lawyers, one M.D (married to an M.D. )., two others married to M.D.s, five Ph.D.s and at least ten of us have M.A.s in some field, somewhere around 9 of us are or have been missionaries (one of them the head of his mission agency for 10 years), and one was a pastor for a while. Plus a bunch of other unique and interesting professions—for example. one of the world’s leading experts in the use of duckweed; a Hindi movie star; a jet engine repairman, an Episcopal Priest that has also been the President of a seminary, several teachers, a management guru, an arborist, a couple computer guys, a couple university profs (one of whom teaches Constitutional Law at a noted law school), several types of contractors, a newspaper columnist in Canada, and one who helped start a Christian University in Lithuania. Not bad. And, as opportunity avails itself, I make the pilgrimage back to India every five or six years or so. And it is almost heaven. The last several times I have taken small groups with me to introduce them to the India I know and love. I have been indelibly marked by my childhood there.